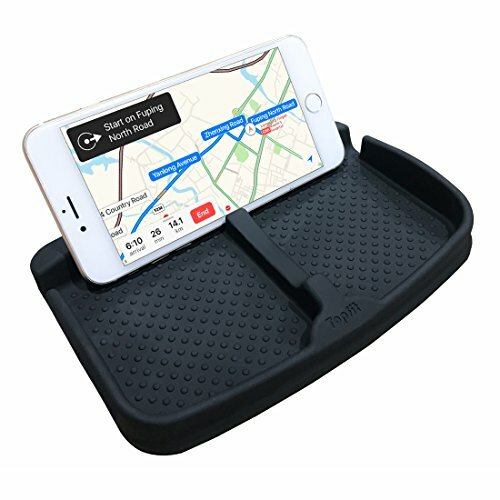 An anti-slip cell phone pad for car dashboard is essential for our car owner. It applies to the vast majority of dashboard, except some curved surface. Does our silicone cell phone pad fit for your Smartphone? Sure! It customized design for 3'' to 7'' cell phone. The holder is suited to most smooth surfaces. It can also be applied to desks, tables, coffee tables, and so forth as well as throughout a vehicle. You can put your key, sunglasses, cell phone, cigarette, coins and other small things in it to prevent them from sliding when you are driving. All with silicone rubber gel material, non-magnetic, no adhesive or glue needed. At home to watch TV, a good stand to hold your phone. At office to lay phone, a good stand to hold your phone. Welcome to shop at BMZX. Wish our product can meet your needs and satisfaction. If you have any problem with your purchase, please CONTACT US FREELY and we will always be here to serve for you. 【Stable and Security】non-slip dashboard phone bracket, simple structure, easy installation. Polished silicone gel bottom, safe and stable, can be placed to dashboard of cars, trucks, SUV etc when driving. Deal with perfect and lock your phone tightly when taking a sudden turn,go and down or slam the brakes on. 【Hassle-free Warranty and Excellent Service】 We provide 30-day no hassle money back guarantee, 12-month quality warranty and professional after-sale customer service. Please contact us if there is anything about which you are unsure or dissatisfied. If you have any questions about this product by BMZX, contact us by completing and submitting the form below. If you are looking for a specif part number, please include it with your message.